Vincent J. Naimoli (born September 16, 1937 in Paterson, New Jersey) is an American businessman, and the first owner of the Major League Baseball team, the Tampa Bay Devil Rays. Naimoli's father was an Italian immigrant who worked for the New York City Subway system and became a self-taught stationary engineer. Naimoli attended the University of Notre Dame, graduating in 1959 and earning a master's degree in Mechanical Engineering from New Jersey Institute of Technology in 1962. Naimoli received his Masters of Business Administration from Fairleigh Dickinson University in 1964, and completed Harvard University Business School’s advanced management program in 1974. Naimoli still attends Irish athletic events regularly. Naimoli has three daughters from his first marriage and one daughter from his second marriage. Naimoli is currently a member of the Fairleigh Dickinson University Board of Trustees. On Wednesday, October 5, 2011 the Naimoli Family Baseball Complex on the Metropolitan Campus of Fairliegh Dickson University was dedicated. Naimoli negotiated a naming-rights deal with Tropicana Products for Tropicana Field, with the team paying for improvements to the stadium and other auxiliary facilities. Naimoli oversaw a design for the stadium with asymmetrical outfield dimensions and dirt base paths, and seats located close to the field of play. FieldTurf was added before the start of the 2000 season. Naimoli was the founder and first owner of the Tampa Bay Devil Rays, a name which was later shortened to the Tampa Bay Rays. Naimoli is famous for his thrifty ways. He refused to purchase internet access and an email system for the Rays to keep costs down, as he felt email was a fad. He also made waves with his policy of enforcement of not allowing outside food against ballpark patrons erupted into an incident in which an elderly woman with diabetes was prevented from bringing food in to the park to regulate her sugar levels. As a result, the woman had to sit in her tour bus for the duration of the game. Naimoil has been trying to sell his 10-acre mansion in the elite Avila community for at least three years in order to move into a smaller property. As a long-time resident of Tampa, Naimoli received the very first "Bridging the Bay" award in 1996, recognizing him as the individual who has done the most to unite the citizens of Hillsborough and Pinellas counties. He also has received similar community service awards from the Urban League, the Jewish National Fund, the Tampa Sports Club, Boys and Girls Clubs and the Multiple Sclerosis Society. He received an honorary monogram from the Notre Dame Monogram Club in 1999. 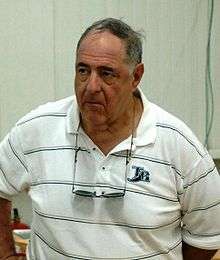 Naimoli, who received an MBA in 1964 from Fairleigh Dickinson University, contributed $1 million in 2007 to be used towards the construction of a baseball complex at his alma mater. The gift paid for the 2011 construction of the Naimoli Family Baseball Complex on FDU's Teaneck, New Jersey campus. In 2006, Naimoli made a contribution of $5 million to his undergraduate alma mater, the University of Notre Dame, to be used towards a $24.7 million renovation project of the Edmund P. Joyce Center, an 11,418-seat multi-purpose arena that is used by the school's basketball and volleyball teams. A 16,500-square-foot (1,530 m2) club / hospitality area which will include concession stands and restrooms, designed to accommodate 750 spectators, will be named for the Naimoli family. In 2009, Naimoli donated a generous gift towards the construction of the Naimoli Family Athletic and Recreational Facility at New Jersey Institute of Technology. The facility will be approximately 25,600 square feet (2,380 m2), housing courts for tennis, and will be made available for other athletic and recreational activities. The facility will be heated, air conditioned and utilize a flooring appropriate for the intended athletics and recreational activities. It is intended to meet the growing demand by our students, faculty and staff for such facilities, particularly, as our student population continues to increase. Naimoli also claims to have made many more millions of dollars' worth of "anonymous donations" to various charities. ↑ "2009 Commencement Honoree: Vincent J. Naimoli". New Jersey Institute of Technology. May 16, 2009. ↑ "Naimoli Family Baseball Complex Dedication". Inside FDU. Fairleigh Dickinson University. September 2011. 1 2 Vincent J. Naimoli, Managing General Partner and Chief Executive Officer, Tampa Bay Rays. Accessed October 22, 2008. ↑ Topkin, Marc (October 7, 2005). "Naimoli's reign". Tampa Bay Times. 1 2 Keri, Jonah (March 9, 2011). "The Devil In Tampa". Deadspin. ↑ "Tampa Bay Rays founder Vince Naimol's mansion up for auction". Tampa Sun-Times. November 13, 2014. ↑ Staff. "FDU baseball complex gets bequest", The Record (New Jersey), December 18, 2007. Accessed October 22, 2008. ↑ Rowe, John (October 4, 2011). "Naimoli Funds FDU's New Baseball Complex". NorthJersey.com. Archived from the original on 2012-05-26. Retrieved May 26, 2012. ↑ "Naimoli Donates Five Million To Joyce Center Renovation", University of Notre Dame press release dated October 20, 2006. Accessed October 22, 2008. ↑ "The Naimoli Family Athletic and Recreational Facility", New Jersey Institute of Technology press release dated June 16, 2010. Accessed September 21, 2010.